How to hide <select> dropdown's arrow in Firefox when using "-moz-appearance: none;". This is no longer a bug. I'm keeping the gist for historical reasons, as it helped to get it fixed. Make sure to read the notes by the end of the post. Set text-overflow to '' (an empty string). This will change anything that extends beyond the element's width to... nothing - and this includes the infamous arrow! Continue reading for the full lowdown. I was experimenting on custom styling the <select> elements of a form I was building. One of the things I tried implementing was truncating the text with an ellipsis in case it extended beyond the <select>'s width. It didn't look consistent through browsers, but I discovered something nice. As this 2011 bug report states, there is an issue regarding Firefox's -moz-appearance and <select> elements: it was supposed to ditch the <select>'s arrow (like Chrome's implementation) but it simply doesn't. People were raging about the subject all over the internetz. Firefox for Android needs the whole width of the arrow as text-indent. It means you need to set it to at least 5px, but take care since Firefox seems to double the text-indent value on <select> elements. 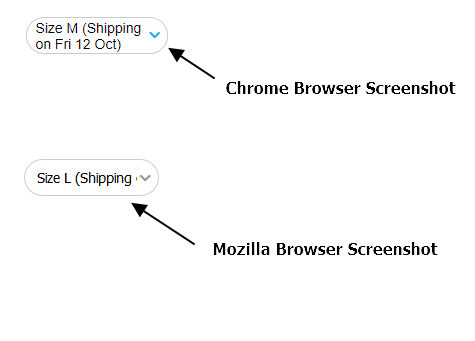 The appearance attribute is not well supported through browsers, so take this workaround with a grain of salt when developing your crossbrowser solution. Tested on latest versions of Ubuntu, Windows, Mac and Android. Binyamin for improving it from 1px to 0.01px. RussellUresti for noticing the white space. MathiasaurusRex for noticing the zoom issue. Edit 3: Mozilla addressed the issue! Target milestone is v35. Yay! Edit 2: Todd Parker from Filament Group tweeted about a CSS only alternative that works pretty much everywhere. You can check it here. Don't use any other value of -moz-appearance as the styles inherited are not customisable. Just added. Thanks for checking, @paulirish. João, I want to correct myself - change 0.01px to .01px. It would deliver the same result and save a bit performance. @laukstein, that's something for your CSS minifier to worry about. If you start to worry about single bytes like that you can continue to remove unneeded ending ;, indentation, etc. I agree with @Qtax. Plus 0.01px makes up for better readability. Turns out that Windows doesn't require the -moz-appearance: none; declaration. Windows 8, FF 23.0.1. You are insane, thanks! It works! Thanks, it works like charm! I hope someday Mozilla gonna solve this. What about IE 8 & 9? @vladakilov they degrade gracefully to the regular arrow, although it might be possible to accomplish some results by playing with position: absolute; and clip: rect(...). I've come across this issue several times now. This is the only solution I've seen so far that works. You're amazing Joao, thx a lot! I had the problem that my SASS parser didn't like the text-indent value of 0.01px and rounded it to 0. This does not work on android firefox. @FDiskas check the "final considerations" part. There is a solution for Android FF as well. You deserve a donation for this. Seriously, where can I donate? Thank you for this, @joaocunha, you beautiful mad genius, you! @kat2014 what version is yours? I've heard some comments about a Nightly version that doesn't support the trick but didn't have time to actually test yet. It works just fine on my v.28 on Ubuntu, which happens to be the latest. This trick has stopped working as of firefox 31 (currently in nightlies). Confirmed, in FirefoxNightly (31), the hack no longer works. In case anyone finds a solution, can you answer my question on stackoverflow? If anything, this bug -and the subsequent fragile workaround- proves that it's better to stand up against browser vendors and demand standard conformity instead of writing quick and dirty hacks. There was a constant outcry on the original bug report in bugzilla where people were voicing their concerns and were asking for a real fix. Until someone came along, felt clever, and implemented a dirty hack which resulted in people stop complaining anymore and got happy with the trick. Now, a couple of months later, the "clever" trick doesn't work anymore, there is no real fix in the pipeline by Mozilla, and above all, almost all the previous objections by the users are dispersed. It will now take much longer to once again rally people around this bug and ask for a fix. Don't treat yourself like we are still in the IE6 era. By advocating a hack to fix a standard-compliant bug in an open source browser you are actually doing a disservice to the community. It will decrease the pressure on the browser vendor's shoulders to actually fix the issue based on standard specs. Please go to the original bug report in bugzilla and demand a real fix. The bug has been there for three years and it's not even in the pipeline to be solved, and you propose people should wait longer? Maybe we still are in the "IE6 era". That is, at least for people who write real websites for real people. There are several ways of styling <select> elements. If you're not happy with resetting its' styles, just do something else. This fix is not dirty by any means. It's completely unobtrusive, and even if it stops working, it will not break anything, except from showing double arrows. You can media-query FF to ignore the background declaration if you want. I was adamant on making this gist as clear and complete as possible, so people can make a proper decision on why to use it. I didn't spread the word as a definitive fix - quite the opposite, I always called it a trick, a workaround. There is no such thing as demanding in the OSS world. You either politely ask for a fix, or either jump in and collaborate. Bottomline: browser specific hacks/workarounds have been there for ages. If you don't use them, you either have a better solution or it's just a big, massive FUD. Please try to be a bit more polite next time you give your opinion. I am sorry if my comment made you feel hurt. This is not a personal attack on you or anything like that. these kind of temporary hacks/tricks/workarounds will only delay the release of the real fix. Because people will implement these workarounds and get on with their life, while the underlying bug still exists in the code. And it just makes it more difficult to fix the real bug. I didn't feel inclined to upvote the bug when I had a workaround. That's exactly what I pointed out in my previous comment. Many people had no reason to complain when there was a workaround. In a sense, it served as a painkiller to them, while what actually needed here is a cure. Now that there is no workaround, people are more motivated to look for a real fix. @pwlin, there's nothing wrong with developing a workaround while we wait for a fix. If users decide not to ask for a proper fix, that's on them. It is not @joaocunha's fault that @itsclockwork didn't upvote the bug. It's unreasonable to hold him responsible for the actions or inactions of random people online. Your argument is junk. Dude, I didn't hold anybody responsible for someone's else actions. But you can not deny the fact that temporary workarounds only help arrogant browser vendors to delay releasing a real fix even longer. This hack does not work anymore, so I feel myself beating a dead horse. Enjoy doing wahtever you feel good to do. If you are using this trick to provide a custom arrow and FF is now showing both the custom and the native ones, there are two ways to get rid of the custom arrow on it. If your arrow is tiny, you can use it as background-image and hide it under the native arrow, as I proposed to Foundation. @joaocunha Thanks, I'm able to use your first option myself. Hoping we see a solution surface now that 30 is released. -moz-appearance: tabpanels; clears out the arrow, but it adds an inset shadow and border radius that I'm not sure how to get rid of. Edit: It appears this is only for FF30/OSX. No luck on windows yet. More Edit: Here's an image of something I did for a project I was working on. The downside is that the select box is wider than the space, but it works no problem. I just made the select box 110% of the width of it's container, and have overflow hidden on the container. @barnettjw the problem with your solution is that you cannot click the arrow. I have an updated solution that I've implemented at work, but I haven't had time to build a pen yet. // Strip away all the browser styles for a select box. // The syntax for this needs to be as follows. // class, or add a class to the div with 'select--clean'. Guys, don't use any other value of -moz-appearance (like window, tabpanels, etc) as the inherited styles are not customisable. Hi, is there any way to remove the default select arrow in firefox and use our image? I have put these two code, but still doesn't work. Do someone found a way not including div? Unfortuantely with @keska's fix, you can't apply padding or margins to the actual <select> tag else the arrow will show up again. if you are interested, my solution is using vendor pseudo class :-moz-any() and pointer events only for mozilla because both is valid since version 3.6. @anupjon's solution worked for me. @joaocunha - Just used your URL prefix method to hide my custom arrow in FF33. Thanks a ton. This issue is quite annoying, tested a couple hacks from here and there, but @anupjon's solution works for me as well in Win 7, FF32. @joaocunha's third solution worked for me. Thank you! Short option labels (like numbers 1, 2, 3...) were causing the select arrow to peak out with width: 120% for me. -moz-appearance: none; will support select elements in Firefox 35. That version comes out in January, and the Developer Edition has this feature now. Here's the Bugzilla ticket. Edit: Whoops, just realized that the content at the top of the gist already explains that. Sorry for the extra comment! The solution is very near of us... maybe in next Firefox release!!! Solution does not work if border: 0. @anupjon FTW!!! Thanks for posting that solution it worked for me. Just need to adjust to account for screen breaks. UPDATE - If you are following @anupjon 's solution, just be aware of the float: left; set on the "selectwrap" div - It will cause a slight issue with various breakpoints. It should be formatted like this for faster and better reading! How to select box text show in 2 line?